Hudson Valley MOCA invites you to leap into the month of May with a selection of colorful exhibitions and sensational activities. It’s officially spring, so start the season by getting the first look at an exhibition from our international artist-in-residence or engaging with presentations at the intersection of poetry and art. Every Saturday in May, 1:00 – 4:00 p.m. Capture the essence of the monumental sculpture of Italo Scanga by erecting your own lofty figure out of plaster, pipe cleaners, and aluminum foil. Saturday, May 4, 10:30 – 11:30 a.m. Following the Northern Wu style of his teacher Tina Zhang, Tai Chi instructor Chris Fox will guide you through the practice of ‘the Form.’ This workshop will take place among the figurative sculptures of our current exhibition, Death is Irrelevant . No prior Tai Chi experience is necessary, and all levels are welcome. Tuesday, May 9, 6:00 – 8:00 p.m.
Thursday, May 11, 2:00 – 6:00 p.m. Writing the Walls 2019 presents an afternoon of poetry readings, workshops, and conversations celebrating the interplay of visual art and the written word. The event features a discussion between sculptor Rona Pondick and Hudson Valley MOCA founder Livia Straus as well as the 13th Annual Poets’ Walk, which premieres a selection of 43 poems and theatrical presentations interpreting pieces from the exhibition Death is Irrelevant . Thursday, May 23, 7:00 – 9:00 p.m. Draw from a life model posed among the figurative sculptures featured in Death is Irrelevant. Start with short poses, followed by longer poses decided through consensus. Bring the dry media you wish to work with (no wet media). Easels, chairs, and stools are available. Anne Samat is the latest in a succession of international artists-in-residence hosted by Hudson Valley MOCA. 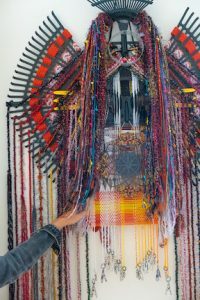 Using intricately-woven textiles and found objects, Samat builds elaborate totems evoking her familial lineage. Based in Kuala Lumpur, Malaysia, Samat is a graduate of the fiber work program at the Mara Institute of Technology . 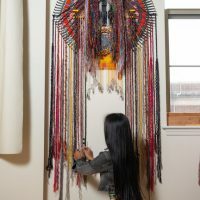 This is her first solo exhibition in the United States. Shining a light on Peekskill’s young artists, Hudson Valley MOCA’s annual student exhibition showcases works made in partnership between local students and professional creators. From sound and video art to sculpture, painting to book illustration, the artworks on display are a presentation of creativity and collaborative production. Featuring international figurative sculpture created over a forty-year period (1975–2018), Death is Irrelevant is a contemporary examination of our timeless inclination to recreate ourselves, explore fragility and mortality, and consider what it means to be alive. This entry was posted in Press Releases and tagged art, exhibitons. Bookmark the permalink.